Picture this…My husband and I embark on a 7-hour car ride to the Outer Banks with the 3- and 5-year-olds behind us in the back seat. Halfway through the trip, the children inform us the iPad they are quietly and angelically playing with has only 15% battery life left. No problem, this mom thinks to herself. She packed the charger, of course! Wait. Where is it? It’s supposed to be right here in this bag. She knows this because she specifically told her husband to take it from the home office and put it in this bag. I heard no such thing, he says. Noooooooooo! Luckily, this was only a nightmare, and oh my goodness, what a scary one! When it comes to long road trips with young children, more thought goes into how to keep them entertained in the car than anything else. With our family vacation and 7-plus-hour car ride coming up in 4 days, my thoughts are consumed by worst case scenarios. A dead iPad and no charger is one of the worst. It turns out there are several ways to conserve your iPad’s battery life. You never know when an emergency might pop up, requiring you to squeeze every last drop of life out of your iPad, so read on to learn how to conserve battery life. Keep your iPad out of the sun or hot car. Of all possible factors, heat will degrade the battery’s performance the most. Update to the latest software. Go to Settings, General, then Software Update to see if you are up-to-date. Lower brightness. Go to Settings, Brightness & Wallpaper, then drag slider to adjust level. Turn off Wi-Fi. Go to Settings, Wi-Fi, and set to Off. Disable cellular data. While using cellular networks allows you to stay connected when you are out of Wi-Fi range, it may decrease your battery life. Go to Settings, Cellular, and set to Off. Use Airplane Mode in low- or no-coverage spots. Your iPad always attempts to maintain a connection with a Wi-Fi or cellular network and, therefore, may use more power in low-to-no-coverage areas. Go to Settings and set Airplane Mode to On. Minimize or disable use of location services. Go to Settings, General, Location Services. Turn off push notifications. Go to Settings, Notifications, and set to Off. Fetch new data less frequently. Certain applications, such as Mail, can be set to fetch data wirelessly at specific time intervals. 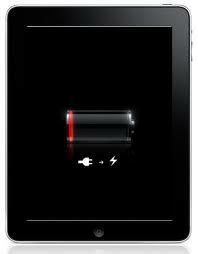 The more frequently this occurs, the quicker your iPad may lose battery life. Fetch new data manually by going to Settings, Mail/Contacts/Calendars, Fetch New Data, and choose Manually. If you set Push to Off, messages sent to your push mail accounts will be received based on the global Fetch setting as opposed to as they arrive. Turn off or delete e-mail accounts. Go to Settings, Mail/Contacts/Calendars, choose an account, and set to Off or delete. Monitor the use of downloaded applications that prevent the screen from shutting off or dimming or apps that use location services. Lock your device when not in use. To do so, press the Sleep/Wake button. Set Auto-Lock so your iPad will turn off more quickly. Go to Settings, General, Auto-Lock, and set the interval for a short amount of time. Basically, when it comes to getting the most out of your iPad’s battery life in an emergency situation, remember that heat and wireless networking of any kind are the main things to avoid. Keep this in mind, along with as many of the aforementioned tips as possible, and hopefully your next road trip with the kiddos will be saved until you can get your hands on a new charger!